JOHN CLAYSON. John is believed to be the second of five sons of John Clayson and Sarah Erridge. He was baptised in Barham, a village between Canterbury and Deal, on 5 June 1735. In the Barham register, the surname was recorded as Clakson. On 7 May 1737, there was a burial in Barham of John Clackson. Since the register at this time does not name the parents of dead children, we might have assumed this to be the two-year-old. But the will of William Clayson in 1807 lists all his brothers, including John. This burial must be of an older John, possibly the son of John and Margaret Clarkson, baptised in neighbouring Womenswold in 1698. The family moved to Walmer, just south of Deal, when John was less than two. The surname was there recorded as Clayson. Four more brothers were born there, but one died in infancy. This was the reign of George II, shortly before the ill-fated attempt of Bonnie Prince Charlie to regain the throne for the Stuarts in 1745. Sometime before his marriage John and his older brother Robert moved further round the coast to Dover. Robert and his wife Jane had a daughter baptised here in 1759. What took the brothers there is unclear, but they may have been in business together. John’s brother Edward became a shipbuilder, and his brother William a mariner. We do not know whether John initially entered a maritime career, but since much of his adult life was spent in the inland village of Eythorne he either was destined for a different occupation or decided to abandon the sea. John was resident in the parish of St Mary the Virgin, Dover, at the time of his marriage. ANN WICKES. At one time John’s wife was thought to be Ann Holman of Deal. Inspection of the parish register has shown this to be a misreading. The most likely marriage is that of John Clayson of Dover and Ann Wickes of Waldershare in 1761. On 27 April 1746 there is a baptism at the church of SS Peter and Paul in Eythorne, very near Waldershare, for Anna daughter of James and Hannah Wickes. Her mother’s name was Hannah Marsh. If she was baptised soon after her birth this would make her only 15 ½ at the time of her wedding, but the marriage age was not set at 16 until 1763, two years after Ann Wickes married John Clayson. In its favour is the fact we have found no early burial or other marriage for this Ann Wickes, and a baptism in Eythorne, so close to Waldershare, is promising. She was the youngest of five children. At the time of her marriage she was living in Waldershare. This is a village NNW of Dover. It is now part of the parish of Eythorne . 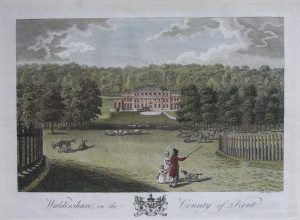 The imposing red brick house of Waldershare Park was completed by 1712. John Clayson of the parish of St Mary in Dover and Ann Wickes “of this parish” were married at All Saints, Waldershare on 20 October 1761. Both signed their names. Ann spelt her name without the ‘e’ which the vicar included. The witnesses were James Smith and Ann Porclage (or Pordage). John would have been 26. They initially set up home in Dover, where their first two daughters were baptised at the church of St Mary the Virgin. John’s brother Robert and his wife Jane had moved north to Thanet by 1764. John and Ann also left Dover. With their young family they moved to the village of Eythorne, six miles north of Dover. Here more children were born. In 1777 two-year-old Henrietta died. She was buried, not in Eythorne but in her grandmother’s parish of Ringwould, 5 miles away, on 11 May. Later that year a son John was born. He was baptised on 7 Sept 1777. John senior died two years later. He too was buried in Ringwould. There is a burial there on 22 Nov 1779 for John Clayson of Eythorn. A week later there is a similar burial in Ringwould for 8-year-old Jane. John and Ann had seen the end of the Seven Years War with France in 1763, but raised their children against the background of the American War of Independence, which ended with the defeat of the British in 1781 and the loss of the American colonies. On 1 January 1781 there is marriage in Deal between Simon Ames and Ann Clayson. But this Ann signs the register with her mark. In 1761 John’s bride Ann Wickes signed her own name. All the known marriages of John and Ann’s children took place in Deal, 6 miles from Dover. Since it is normal for women to marry in their home parish, it is reasonable to assume that the remaining family had moved there by 1786. There is a burial in Walmer on 26 Nov 1781 of Ann Clayson widow of Deal. The former Ann Wickes would have been 35. Alternatively, there is a burial in Ringwould on 31 Oct 1783 for Anne Clayson, also from Deal. This Anne is not said to be a widow, but it follows the pattern for John’s burial. Ringwould is only 2 miles from Deal. Their daughter Charlotte married John Marsh on 21 Jan 1786. The elder son William married Ann Williams on 5 Dec 1789. Peace was short-lived. 1789 saw the French Revolution across the Channel. This was followed by the Napoleonic wars with France, which brought conflict much closer to Kent. The shore fortifications and the sea around Deal and Dover were busy with preparations for a French invasion. 16 Nov 1793 the couple’s daughter Mary married Morris Langley. He was a boatbuilder who came to have his own business, like John’s brother Edward. Their daughter Ann married William Moulton on 24 May 1796. The younger son John married Sarah Banks in Deal on Christmas Eve 1803. Mary’s husband, Morris Langley, was a witness. The eldest daughter, Sarah, was alive but still unwed in 1808.